Lake House Cottages and B&B are situated in the heart of Ruby Country, rural North Devon, close to the village of Bradworthy and on the edge of an Area of Outstanding Natural Beauty. Peter and Lesley extend a warm welcome to B&B guests in their period farmhouse, with two extremely well appointed en-suite bedrooms, a double and a twin. 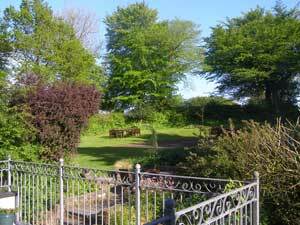 The rooms are tastefully furnished with great attention given to comfort. Within ten miles of the coast and close to many wonderful walks this is a superb location to explore Ruby Country in any season. Guests will love the peace and quiet, the sunny, flower filled gardens, the beautiful countryside, the cliff walks, the glorious sandy beaches and the friendly local pubs with great food. Amongst th e facilities provided are tea and coffee making, digital TVs and clock radios. The spacious double bedroom has its own seating area. 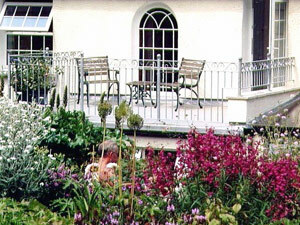 B&B guests also have direct access to their own south facing balcony overlooking the gardens. Sharing a private landing, the two rooms (and the balcony) can also make an ideal suite of rooms for a family or group of friends holidaying together. New fo r 2012, Hidden Lakes and Hidden Lakes Meadow are also available exclusively to guests. Just 300 yards along the lane this peaceful spot has two lakes, one offering coarse fishing, and a six acre meadow, ideal for dogs (and children) to let off steam! 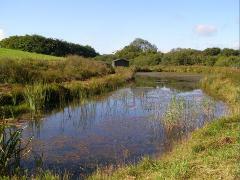 This entry was posted in Accommodation, Bed and breakfast and tagged accommodation, Bradworthy, Devon, ruby country, walking. Bookmark the permalink.